You might be wondering "Why are these folks selling eggs? I thought they only sold beef..."
Well, we started with just a few layers for ourselves but then... one thing led to another and more people began asking for eggs so... we now have a productive flock of happy laying hens. Raised on certified-organic pasture, our certified-organic and SPCA-certified layers lead pleasant lives doing what chickens love to do. Foraging, pecking, scratching for bugs, and coming-and-going as they please. And the eggs are 100% soy-free (learn more here). We believe that healthy, happy chickens are going to lay better tasting more nutritious eggs. This is why we have gone to a unique model for our chickens that is superior, we believe, to any other model. 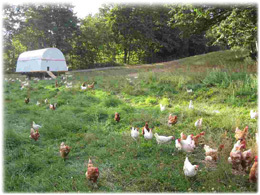 Our chickens live on acres of beautiful, green pasture. 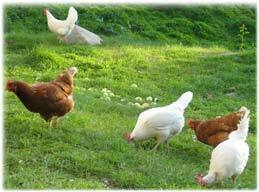 The chickens always have fresh pasture grass to forage, scratch and peck in, the way they should. The result: more flavorful eggs and truly happy chickens. These nutrient-dense delicious eggs are not only certified-organic, but are healthier and tastier than anything you can buy at the store. And by the way, unlike factory-farm eggs, our eggs vary from season to season. What do we mean by that? When chickens are allowed to forage on fresh pasture, 365 days a year, their diet will vary depending on what species of plants and bugs are available. For example, in the late spring and early summer, when all of nature is coming to life, the chickens will gorge on new grass and insects, resulting in a darker yolk. In winter, their yolks are a lighter color due to the dormant grasses and the fewer number of bugs. Some seasons produce darker yolks, some firmer whites --- it's a natural rhythm. And so we adapt our expectations to fit the natural cycle, rather than forcing the chicken to produce a standardized "product" the way some factory-farms do by feeding their chickens additives to give the yolks a dark appearance year-round, confusing the buyer into thinking they're getting a fresher egg. Another nice thing about our pastured eggs is the freshness. A fresher egg will have a very firm yolk, and a very firm white. (Hint: when you hard-boil our eggs, you'll notice they are harder to peel than a supermarket egg. The fresher the egg, the harder it is to peel when it's hard-boiled. The trick is, dunk the hard-boiled egg into ice-cold water after you boil it --- it makes it easier to peel). If you'd like try some healthy eggs from happy chickens, click here to order.